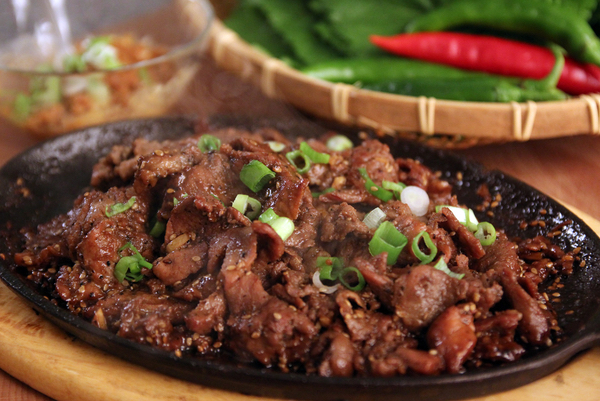 Bulgogi - bul ("fire") and gogi ("meat") - is one of the most popular dishes in Korea. Pronounced "buul-GOH-ghee", it is a dish of grilled thinly sliced, prime cuts of meat marinated in a mixture of soy sauce, sesame oil, garlic, onions, ginger, sugar, and wine. It is often eaten wrapped in lettuce or spinach leaves and accompanied by kimchi (fermented vegetable pickle). The meat is often grilled by diners in Korean restaurants on miniature barbecue embedded in the table. Whisk water, soy sauce, sugar, sesame oil, garlic and onion powders, and Korean red pepper flakes in a large bowl until the sugar has dissolved. Add the sliced rib eye and let marinate for 1 hour. Heat the vegetable oil over high heat in a large cast-iron pan. Drain the meat and discard the marinade. Cook the meat in small batches, 1 minute per side, flipping once, until caramelized and golden. Transfer to a platter. Garnish with the scallions, sesame seeds and more pepper flakes, then serve with steamed rice and kimchi.